Who is Gigantus / Goliath? Gigantus / Goliath is a monster that appeared in early Marvel comics in the early 1960s. . This post is part of the Toylab Marvel Monster series that focuses on old Marvel Monsters in preparation for the 2017 Marvel Comic event Monsters Unleashed. Place of Origin: Mu (Ancient city on Earth) this may have been altered to Subterranea at some point see continuity error section at bottom of page. In his initial appearance Gigantus is outsmarted by a Mr Baxter. Mr. Baxter saved the world from being ruled Gigantus. Not many Baxters are mentioned in Marvel comics its possible that this Mr. Baxter gave the Baxter Building long used as the HQ of the Fantastic Four its name. I can validate this but I have been unable to find any other references to a Baxter in Marvel comics. Ulyssess Bloodstone the monster hunter and adventurer encountered Gigantus on an expedition to Monster Island. His group was attempting to rescue their friend and companion Mokkari who had been taken to the Isle. As the expedition approached Monster Island, Gigantus rose up from the sea to block their path. Bloodstone used the craft's flaming engines to scorch Gigantus causing the large monster to retreat back beneath the sea. Gigantus's quick movements to submerge himself cause a small tidal wave that wreck the expedition's cruiser on the shore of Monster Island. Gigantus is a huge monster from an aquatic civilization called Mu. He is sent by a King of his people out to conquer the world. The giant monster seems to be unstoppable. He goes into a harbor and unleashes havok where he goes. However a clever Hollywood special effects maker by the name of Mr. Baxter creates a fake giant monster that is even larger than Gigantus. This fake monster calls itself Ulvar and claims to be an alien that has come to conquer Earth. See the huge Ulvar gives Gigantus second thoughts and he fleas back into the sea believing he has met his match. Gigantus appears among an assortment of monsters in one of Peter Parker's nightmares. At some point Gigantus joins forces with the Mole Man and living in the kingdom of Subterranea. He is ordered by the Mole Man to retrieve the Skrull named Inorganic Techno Troid. In doing so he was forced to battle two teams of the Fantastic Four and was being beaten. The Mole Man and Gigantus retreated seeing that the odds were against them. Gigantus encounters Adam Warlock when Warlock comes to Monster Island. The Mole Man sends Gigantus toward the Infinity Watch members as a welcome party. Gigantus also appears to be banished by Asgardians in one story. He returns and is beaten back by Namor. It is not clear if Goliath will appear as part of the Marvel 2017 event Monsters Unleashed. Aquatic Amphibian - Can breath underwater, and above water. Gigantus is a fairly obscure character but has managed to show up a few times in the Marvel universe. Bizarrely these appearances sometimes present facts that appear to be at odds with his previous appearances. This is definitely some back corner Marvel universe stuff but for those who are geeks about this kind of thing here is what I have managed to unravel. Its pretty funny for a character who has only appeared a few times to have this many glaring questions. This is what happens though when a character randomly appears again decades after he was first created and information on his original appearance is forgotten. This is especially true in the age prior to the internet where people went off of paper notes, old comics and memory. I label these as "Potential" Continuity Errors because I think if someone wanted to they could explain many of these errors away with some clever writing. 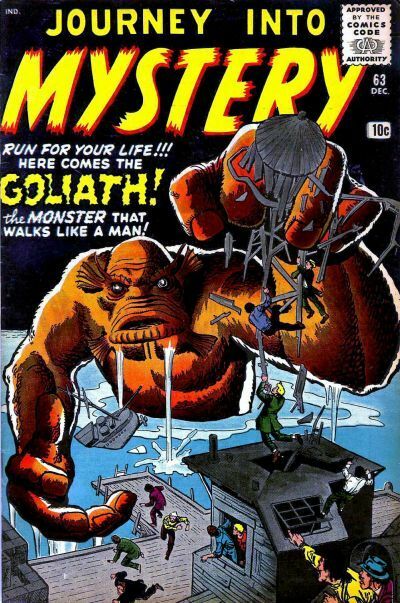 When Gigantus first appears in Journey into Mystery #63 he is referred to as Golaith the Monster that walks like a Man. He is never referred to by this name again. The story is later reprinted in Where Monsters Dwell but in this appearance his name is changed to Gigantus the Demon from the Depths. I have not found an explanation for the change my guess is that they thought Gigantus sounded more cool. I have not noticed many other changes between the Where Monsters Dwell version and the original. One funny change is there is an added word balloon on the cover of the Monsters Dwell where a man shouts "Run for your life, it's the monster that walks like a man". This line plays homage to the original description of the character back in Journey into Mystery. Where Monsters Dwell series is basically made up of later reprints of older monster tales so many of these monsters made their 2nd appearance in that series (Including popular Monsters like Groot). This period of time is revisited in the late 1990s in the series Marvel Universe #7 that focuses on the exploits of Monster Hunter Ulysses Bloodstone. Tom Brevort in the notes of Marvel Universe #7 states that Gigantus was previously named Gargantus and appeared in Strange Tales #80. A character named Gargantus does appear in Strange Tales #80 but this is a different character than the Gigantus/ Goliath character. His first appearance Gargantus in Strange Tales #80 does look a lot like Gigantus with the biggest difference being that he is gray blue and not orange. However, Gargantus appears again in a story called The Return of Gargantus in Strange Tales #85 and this time he looks very different. With the 2nd story I think its clear that Gargantus is a separate aquatic monster and Brevort was mistaken in the notes of Marvel Universe #7. Covers of Gargantus Covers in Strange Tales 80 and 85 below for comparisons sake. Mu King or Mole Man? In his first appearance Gigantus relates a story of being sent to conquer the world by a King of the Muvians. This King is never mentioned again and later stories Gigantus works directly for the Mole Man. Its possible that the Mole Man replaced the Mu King in later printings and reimaginings of the character. Mu has generally been depicted with humanoids not Orange skinned monsters like Gigantus. Mu appears in Namor comics 1 and 2. It also appears in Marvel Tales #44 where the beautiful but abandoned city of Para Diss is discovered. In both comics Mu is the Continent that the ancient Lemuria civilization rested upon. This continent was destroy by the Celestials and sunk into the ocean. In Namor some of the Muvians survive in a underwater city. It is possible that Gigantus was part of a separate species that survived species from Mu that survived the cataclysm. However, this is never explained. In later appearances Gigantus is a part of Mole Man's deviant monsters. These other monsters all come from Subterranea and I have seen numerous sources list Subterranea as Gigantus's place of origin. Its possible like the Mu King that Subterranea has replaced Mu. Gigantus appears in different colors Orange, Green and Brown. He is green in Fantastic Four #349, brown in Warlock and the Infinity Watch #7. In all other appearances Gigantus appears to be Orange. Once again if Marvel wanted to this could be explained way with a quick blurb about how Gigantus can change colors but on its face it appears to be an error.